As part of the new campaign, environmental clubs have created a petition for UT students to promote the expansion of recycling services on UT’s campus. The online petition asks UT “for clearly labeled recycling in every dorm, academic spaces and facilities.” as stated by the petition. 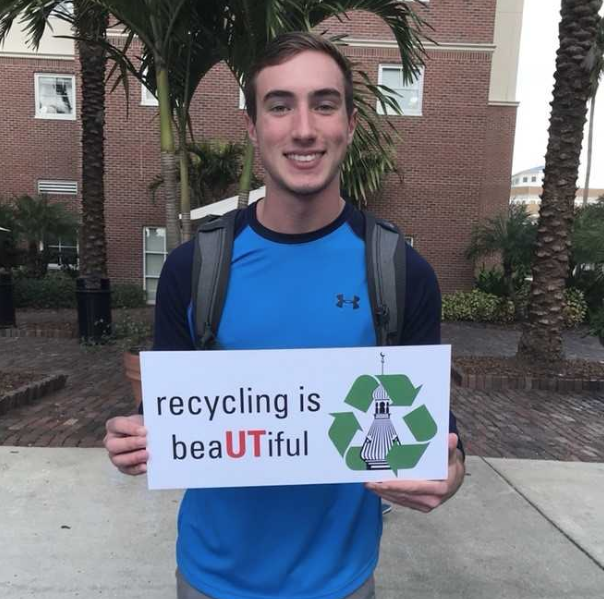 By signing the petition, the campaign is aspiring to quantitatively demonstrate that the UT community (students, faculty/staff, alumni and parents) supports recycling expansion. The campaign’s purpose is to show that the UT’s student population wants to enhance recycling because they expect a higher standard on campus. Students are petitioning to increase recycling opportunities; create more programs like the Pilot program that started in 2014. The Vaughn Center is currently the only residence hall with an active pilot recycling program. The program was initiated by the Student Environmental Action Coalition (SEAC) and the FSC. Each of the six resident floors has two Trash & Recycling rooms, so there is a total of 12 recycling collection bins. Students involved are carrying out the campaign in two ways. The first step is looking for signatures, the second step is taking photographs of anyone who supports the campaign holding a “Recycling is BeaUTiful” sign to promote the campaign. “This petition is something that students themselves are doing because they want to see an improvement,” Senior, majoring in Marine Science and Biology, Lauren Twele, President of Student Environmental Action Coalition (SEAC), said. The petition is currently a few signatures short of 1,000 signatures, and the ultimate goal is 4,000, roughly half of the student population. The petition signatures will be collected until April 22 on Earth Day, which by that time these environmental organizations will propose to UT’s upper administration the efforts made to make a better change to our community. “In that period of time we really want to show that this is something the students care about,” Twele said. These organizations are tabling in the Vaughn center this semester once a week, for UT students to take action to promote the campaign and sign the petition.